The ancient Romans celebrated the holiday of Saturnalia on this day, the 17th of December. (At least in early Roman history it was a one-day holiday; later, it was extended so that it started on the 17th and lasted through the 23rd.) Saturnalia was a festival of good cheer and relaxed social strictures, thought of as recreating a lost golden age ruled over by the god Saturn. Typical practices included feasting, gift-giving, and a holiday from the usual social rules: children got to order their parents around while adults played children’s games; the masters of the household served a feast to their slaves; and gambling, which was a popular passtime but not usually allowed in public, was freely tolerated. Romans played many different gambling games, but some of the most popular involved dice. 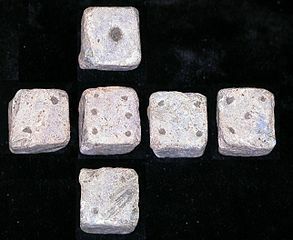 One common game, known as tali, was played either with the knucklebones of sheep or goats (called astragals) or with cubical six-sided dice marked with the numbers 1 through 6, like modern dice. Astragals had four sides. For gaming purposes, it seems they were assigned values of 1, 3, 4, and 6. When playing with six-sided dice, only those numbers were used; 2 and 5 were ignored. The rules of tali are not entirely understood today. Probably there were many different variations with different rules, and all of them were so common that no one bothered to write down instructions for how to play. Here is a playable modern interpretation based on what we can gather from literary references and artistic depictions. All you need for any version of the game is four six-sided dice and something to bet with (coins, poker chips, chocolates—whatever you like), although a pencil and piece of paper for each player to record their throws can also be useful. Each player pays an ante into the pot. Each player then rolls four dice, either their own set or taking turns with a common set. Each player’s roll is then scored, and the winner takes the pot. If no one wins a round, everyone rolls again. If two or more players tie, only those players roll again until someone wins. Dice rolls are scored according to the following system in which “hands” of dice are ranked, much like hands of cards in the modern game of poker. 6,4,3,1 – called Venus, the best roll, always wins. Rolls that include at least one 6 (apart from 6,6,6,6, which is a Vultures—see below) are called Senio and are scored by totaling the numbers shown (excluding the numbers 2 and 5, which are not counted). Any Senio always beats a Vultures or a roll that includes no 6. Rolls that show four of the same number, called Vultures, score at the bottom of the heap, but will win over other 6-less rolls. 6,6,6,6 – called Vultures, beats only a lower Vultures, The Dog, or a roll without a 6. 4,4,4,4 – called Vultures, beats only a lower Vultures, The Dog, or a roll without a 6. 3,3,3,3 – called Vultures, beats only The Dog, or a roll without a 6. 1,1,1,1 – called Vultures or The Dog, beats only a roll without a 6. Any roll that has no 6 (except a Vultures) always loses. B wins this game with a Senio of 10. Even though D’s roll totals higher, it has no 6, and therefore automatically loses. Each player rolls their dice in secret and hides the total (or, if using a common set of dice, records their roll in secret). After an initial bet, players raise, call, or fold in turn, as in poker, until everyone calls or folds. The players still in the game then reveal their rolls and the winner takes the pot. Each player rolls their own dice (this variation is difficult to manage with common dice). Any player may then ante into the pot again for the chance to reroll a die. Repeat either for a limited number of rerolls or until everyone passes. The player with the best roll on the table wins the pot. Each player rolls one die and either keeps it (if using individual dice) or records it (if using common dice). After all players have rolled once, each one either antes into the pot or folds. Repeat three more times until all players have rolled a full four dice. The player with the highest roll among those still in the game takes the pot. It sounds like a simple question that ought to have a straightforward answer, but both the question and its answer are far more complicated than they appear. In these posts, I dig into the topic to explore what we know, what we don’t know, and what we mean by race in the ancient Mediterranean world. In the past entries in this series, we have talked a lot about theories of identity, how we can interpret (and sometimes misinterpret) both written and artistic sources, and the problems in knowing just who we mean by Greeks and Romans in the first place. Today we approach the question from a different angle, looking at one individual and the world she lived in. Around 400 CE, a wealthy lady was buried near the Roman city of Eburacum (modern York) in northern Britain. She was buried with jewelry including an assortment of bangles, some of white ivory from Africa, others of black jet from Britain. Her name is not recorded, but she has come to be known, because of her jewelry, as the Ivory Bangle lady. Examination of the Lady’s remains using the techniques of forensic anthropology shows that she was of African ancestry and had spent her childhood in a warmer climate, perhaps somewhere in southern Europe or North Africa. Her skull has features typical of sub-Saharan African populations and in fact the reference measurements that most closely match her skeletal morphology come from nineteenth-century black Americans. Although no indication of her skin color survives, it is almost certain that, if we passed her on the street today, we would describe her as a woman of color. Roman York may seem like the last place we would expect to find evidence of racial diversity. It was the northernmost city in the Roman empire, just a little over a hundred kilometers from the Scottish frontier. There are few places in the Roman world that were farther from the cosmopolitan centers of the Mediterranean, yet archaeology has revealed late Roman York to have been a vibrantly multi-ethnic city. Individuals from Gaul, Italy, and Egypt are mentioned in Roman-period inscriptions from around York. Local potters made cooking vessels characteristic of North African cuisine. A Germanic king with his retinue of warriors is attested in the city backing the emperor Constantine’s rise to power. Not far away, in the forts along Hadrian’s Wall, soldiers were worshiping gods imported from Syria and Persia. A North African woman of Sub-Saharn African descent would have been right at home in such a place. What did she think of herself? We have no way of knowing except to try to interpret the circumstances of her burial. The bangles with which she was buried may suggest a consciousness of being both African and British, although ivory and jet were both prized in late Roman jewelry. They certainly, however, point to a family of wealth and status. The remains of a wooden box were also found in the grave, including a decorative mount carved with the text “Hail, sister, may you live in God” (AVE S[OR]OR VIVAS IN DEO). The text suggests a Christian connection, although the richness of the lady’s grave is at odds with the contemporary Christian preference for simple burial. The Lady may or may not have been Christian herself, but she certainly had contact with the Christian movement. The most noteworthy thing about the Lady’s burial may be how unremarkable it is. It is in many ways an entirely typical late Roman provincial grave for a woman of high status. Her choice of jewelry may have been meant to say something about her origin, but it was a choice that would not have stood out among her peers. She was in touch with one of the major religious movements of the day but buried in a traditional fashion; she was neither ahead of nor behind the times. If we had only the grave goods and not the remains, there would be nothing to suggest that the deceased belonged to an ethnic minority. The most important thing for us to learn from the Ivory Bangle Lady is this paradox: the relative scarcity of people of African origin in the ancient Mediterranean literary record is the product of their presence, not their absence. There were enough North Africans in York to influence the local pottery market, but in most respects they were just like other provincial Romans. They followed the same social trends and religious developments as their neighbors. They had come as soldiers in Roman service, as merchants, or as travelers, just like the Gauls, Italians, and Germans who also ended up in York. They were of all genders and lived at all levels of provincial society, from the bottom to the very top. 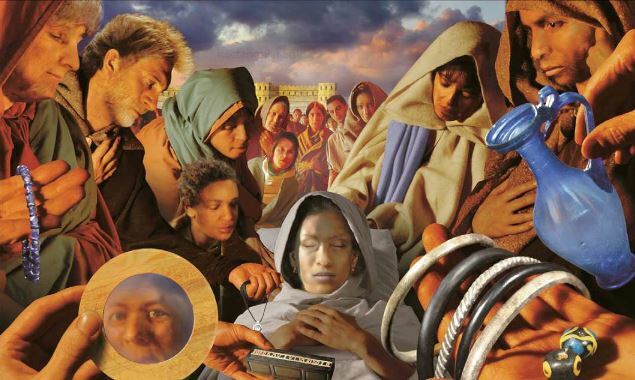 Among them were people with features typical of sub-Saharan Africa and who would likely appear to us as black, but in their historical context, they were just Romans like everybody else. If there were women like the Ivory Bangle Lady in York, the farthest Roman city from Africa, then people of black African descent cannot have been uncommon in the cosmopolitan cities of the Mediterranean. If they are not evident to us in the sources, it is in part because they were so commonplace and so thoroughly integrated into ancient Mediterranean culture that contemporary authors didn’t feel the need to mention them. People tend not to write about the ordinary. We know this well enough from modern social media: our Facebook friends and Twitter celebrities mostly post about the unusual things that happen to them, good or bad, not the everyday events of a typical day. The same principle applies, even more so, to ancient authors, given how much more costly and difficult it was to put their observations onto papyrus in ink than it is to fire off a tweet today. Archaeology, especially with current developments in genetic research, may provide us with individual cases like the Ivory Bangle Lady, but most of the racial diversity of ancient populations will always be invisible to us because most graves don’t survive in good enough condition and the resources available for research are limited. But individual cases like late Roman York are a reminder that there was nothing the least bit unusual about people of many different backgrounds and—in modern terms—different races living side by side in antiquity. S. Leach et al., “A Lady of York: Migration, Ethnicity and Identity in Roman Britain,” Antiquity 84, no. 323 (March, 2010): 131-45. Patrick Ottaway, Roman York. Stroud: Tempus, 2004. Hard questions don’t have easy answers. Sometimes, the best way to get a good answer is to start with some bad answers and try to understand why they are bad. Today we look at a few bad answers that people have given about race in antiquity to see what we can learn from them. When I call these answers “bad,” I don’t mean that there is nothing good in them or that the people who gave them were bad or foolish people. They are “bad” in the sense that they miss important facts or misunderstand the realities of the ancient world, but this is where most answers to most interesting questions start. The process of research, in almost any field, is a process of making our answers less bad through gathering more facts and thinking more carefully about them. We can’t do that effectively if we don’t have a place to start or if we don’t take a close look at our bad answers to understand how to make them better. If you have spent any time reading about the question of race in the ancient Mediterranean, you have probably come across some version of these answers. I’m not linking to any particular sites because I don’t want anyone to feel called out or personally criticized. What’s important is that we learn from these bad answers in order to come up with better ones. In the last installation, we looked at some simple bad answers that were easy to move past. Today we look at couple of more complicated bad answers. These ideas take more work to explain and understand, but the reward of doing so is a fuller and deeper grasp of the problem. 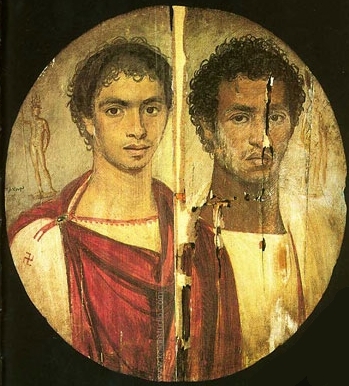 Skin color is one of the primary markers of race in the modern West, but ancient authors and artists did not describe or depict skin color in ways that match up with modern racial categories. Knowing this, some historians have gone looking for other indicators of racial identity such as hair. There are various descriptions of individuals and groups of people, both mythic and historical, in classical literature that mention hair color. The legendary hero Achilles, son of Peleus, for instance, is typically described as having fair hair. Although Greek word for colors do not always match up with our own, the word used to describe Achilles’ hair here, xanthos, generally refers to a yellowish color tending towards orange or red. It can be used to describe not just hair but gold, wine, even fried fish. However we might interpret this description of Achilles, it seems clear that the epics imagine him somewhere on the spectrum between blond and redhead. He was a young man then, fine to look at, with a strong body and a face that was handsome without being boyishly pretty. His eyes were powerful and seemed to flash with lightning. His hair, reddish blond and naturally curled, seemed to gleam as if on fire when the sun struck it. Some were of the opinion that he scattered gold dust in his hair before going out, while others believed that he was bathed in a holy light. Some people point to descriptions like these, as well as other references to people in the ancient Mediterranean having blond or red hair (or blue or green eyes), as evidence that the people of ancient Greece and Rome must therefore have been, in modern terms, white. That argument, though, will not stand. We might first point out that some of these people never actually existed (like Achilles), and that for those who did (like Commodus), we have no independent way of verifying whether the accounts are accurate or not, but this is not the real problem. Achilles may not have been a living person, but it seems clear that the oral tradition about him intended the audience to understand him as being fair haired. Herodian’s description of Commodus may be exaggerated (with the lightning eyes and the holy light in the hair), but he was clearly writing to an audience that was prepared to accept the idea of a blond Roman. We can also point out that hair color is not a perfect proxy for race. Yellow-red hair and pale skin do often go together, but it is perfectly possible to have either one without the other. Still, statistically speaking, any human population with a significant number of blonds in it is almost certain to also have a significant number of people in it we would call white. The problems with the hair argument are deeper. We can all recognize what’s wrong with that answer. Knowing the racial identities of a few real and/or made up people tells us almost nothing about the racial makeup of the larger societies they existed within. The number of people from antiquity whose hair color (or other physical features) we know about is vanishingly small, and the individuals in question are far from a representative sample. The contention that a few blonds here and there in classical literature tells us anything meaningful about race in the Greek and Roman world assumes that there can only be one answer, that Greeks and Romans had a single, coherent racial identity which allowed for no change or variation. We don’t have to scour ancient sources for references to hair color to know that this was far from true. You knew we’d get here eventually, didn’t you? Of all individual people in antiquity, no one’s racial identity has been more fiercely debated than that of Cleopatra VII, the last Ptolemaic queen of Egypt. Some people argue that Cleopatra should be identified as black. Sometimes this argument is made on very thin premises. (Cleopatra was queen of Egypt, which is on the continent of Africa, but that is not the same as being ethnically Egyptian, nor is being Egyptian necessarily the same as being black. Shakespeare’s play Anthony and Cleopatra refers to her skin as dark, but Shakespeare lived a millennium and a half after Cleopatra and had no first-hand knowledge of her appearance.) But there are more serious arguments about Cleopatra’s race that require more serious engagement. Cleopatra was a member of the Ptolemaic dynasty, descendants of the Macedonian general Ptolemy, who ruled Egypt for three centuries after the empire of Alexander the Great broke up on his death. The Ptolemies prized the purity of their bloodline and frequently intermarried among different branches of the family line, sometimes even between brother and sister. As a royal dynasty whose claim to power depended on descent, the Ptolemy family preserved lots of information about their ancestral line. We know more about Cleopatra’s family tree than almost anyone else in the ancient Mediterranean, but the fact is that this information only covers about three fourths of her ancestry. Despite the careful record-keeping of the Ptolemies in general, Cleopatra’s mother is poorly documented, and we know nothing at all about her maternal grandmother. Some have argued that the lack of information about Cleopatra’s grandmother is itself significant, that it reflects the family’s attempt to bury evidence of a marriage (or non-marital relationship) that was outside the norm for Ptolemaic kings, who resided among a mostly Greco-Macedonian court in Alexandria. They argue that the mystery woman must therefore have been an Egyptian. Advocates of this position further argue that Greek, Roman, and other European authors whitewashed Cleopatra, removing any reference to her African heritage in order to claim such a symbol of beauty and power for white Europe. This argument is a nuanced one that draws on real and substantial knowledge not only of the Ptolemies but of the sordid history of modern Western scholarship, which has often embraced racist and white supremacist interpretations of history, erasing or ignoring the lives of non-white peoples and individuals. It is an argument that some people of color today understandably find empowering and satisfying: it must feel good to “reclaim” one of the most widely-recognized names in history. Still, it is an argument that ultimately rests on the same faulty premises and flawed reasoning as the other bad answers we have looked at. To begin with, we cannot assume that Cleopatra’s grandmother was Egyptian. “Unknown” simply means “unknown.” Most of the women at or in the orbit of the Ptolemaic court were ethnically Greek or Macedonian. Few Egyptians even lived in Alexandria, which was considered separate from Egypt, not a part of it. There were, however, substantial Jewish, Persian, and Syrian populations in the city, whose elite members had a better chance at finding their way into the royal court than most Egyptians did. It is not impossible that a member of the royal family could have had a relationship with an Egyptian woman, but the odds of any given unidentified woman in the Ptolemaic court being Egyptian are very long. Even if Cleopatra’s grandmother was Egyptian, Egyptian is not the same as black. Certainly no ancient Egyptian would have described themselves that way, but even if we approach ancient Egypt in the terms of modern racial categories—what would we call them if we saw them passing by on the street today?—this simple equation will not stand. The ancient population of Egypt was complex. Genetic evidence reveals a core population most closely tied to other North African peoples of the Mediterranean coastal zone, but also with traces of long-term immigration from both southwestern Asia and sub-Saharan Africa. Artworks and literary sources suggest that Egyptian skin tones could range from very dark brown to very light tan. Certainly there were some ancient Egyptians who, if they appeared before us today, we would describe as black, but there were many more we would not. It is not impossible that Cleopatra’s grandmother was Egyptian. If she was, it is also not impossible that she had sub-Saharan ancestry and dark skin. Literary evidence suggests that one early Ptolemaic king had taken an Egyptian woman as a mistress, known as Didyme, who may have been dark-skinned, so there would be historical precedent for such a relationship. (Athenaeus, Deipnosophists 13.37 = 576e-f; Asclepiades, in the Palatine Anthology 5.210) It may be more significant, however, to note that although the Ptolemaic family ruled Egypt for some three hundred years, Didyme is the only Egyptian woman we know of who was involved with a member of the family. All of this is very tenuous grounds for making claims about Cleopatra’s race. Was Cleopatra whitewashed by Greek and Roman authors who wanted to claim her for “their” people? Quite the opposite. Cleopatra was embroiled in the last stage of the long-running Roman civil war as a supporter of Mark Anthony against Octavian, the future emperor Augustus. Octavian’s propaganda strategy depended on convincing the Roman people that the civil war was over. He therefore portrayed his struggle against Antonius not as the last gasp of that conflict but as the glorious Roman conquest of Egypt. Anything that made Cleopatra appear as an exotic foreign potentate was perfectly suited to his needs. Although the Roman sources do their best to exoticize Cleopatra, none of them makes any remarks on her skin color or ancestry. not seeing the twin snakes coming behind her. The images invoked against Cleopatra were of drunkenness, luxury, and the (from a Roman point of view) strangeness of Egyptian religion, but not her appearance or ancestry. Roman political invective could make hay out of even the most trivial personal quirks; if the smear campaign against Cleopatra said nothing about her ethnicity, that must mean there was nothing about it that a Roman audience would have found unusual. Both of these approaches, intentionally or not, buy into racist claims about a pure white ancient Mediterranean. They only make sense within the parameters set by that assumption. Achilles’ blond hair only seems useful as a measure of ethnic identity if we already assume that the ancient Greeks were uniformly white. The gaps in Cleopatra’s family tree only appear tantalizing if we buy into the notion that people of color in the ancient Mediterranean were a rare and scandalous secret to be covered up. Without the assumption of whiteness, neither of these cases is particularly interesting or useful at all. The mistakes of the past can be hard to overcome, even when we are actively trying to challenge them. Sometimes that hardest thing to do when looking for new answers to old questions is to see the weaknesses in the questions themselves. Let’s talk about pirates. (No, not talk like pirates—that comes later this week.) In popular culture, we typically think of pirates in the waters of the Caribbean in the 17th and 18th centuries, but the practice of cruising the seaways and taking plunder by force is an ancient and worldwide custom. For some people, raiding passing ships was an accepted and ordinary way of life. Among those people were the ancient Illyrians. The Illyrians lived along the mountainous western coast of the Balkan peninsula, in the vicinity of modern-day Albania, Montenegro, Croatia, and Bosnia-Herzegovina. Much like the Greeks who lived to their south, they shared a common culture and language, but were not politically unified. Small-scale warfare and raiding between Illyrian tribes was a normal part of life, but Illyrians also frequently went beyond their borders, raiding nearby cities and sailing out into the sea in small, fast boats to attack passing ships. The Illyrians were well placed to make a profit on plundering shipping. From their position along the Adriatic coast, they could easily strike at trade routes through the Adriatic, and more organized raiding parties could hit the major routes that between Greece and Italy, connecting the eastern and western Mediterranean. For much of the ancient period, Illyrian piracy was a present but manageable danger in the Mediterranean, more an occasional nuisance than a real threat to trade, but in times of turmoil, when the more organized states of the region were less able to deter attacks, Illyrian tribes could become more ambitious. 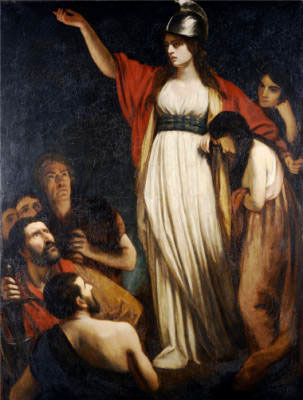 One tribe that took advantage of such chaotic circumstances was the Ardiaei, who aggressively pursued not only raiding at sea but conquests on land as well under their queen Teuta (ruled 231-227 BCE). At this time, the major powers of the both the eastern and western Mediterranean were busy with their own problems. The Greek world was consumed with wars between the kingdom of Macedonia and several alliances of Greek cities. Tensions were rising between Rome and Carthage as the two major powers in the west slid towards a second war. Teuta’s husband and predecessor as ruler, Agron, had gotten his people involved in Macedonia’s wars and expanded his tribe’s control over large areas of Illyria. Teuta carried on with an aggressive policy that combined piratical raids on nearby shipping lanes with territorial expansion along the Adriatic coast. …that she would try to take care that no injustice should be done to the Romans by the Illyrian nation, but that it was not the custom for Illyrian monarchs to prevent their people from making their living on the sea. Teuta’s response was somewhat disingenuous, given that she had directed and made use of seaborne raids for her own purposes, but it also shows how the Illyrians thought about their piratical activities. Teuta was making a distinction between piracy and war. War, from her point of view, was a collective effort by a whole nation, directed by its leaders against a defined enemy. Illyria was not at war with Rome, and she promised the Roman emissaries that she and her forces had no intention of attacking Roman territory. Her wars were in Greece. Piracy was something different. It was not a way of making war but a way of making a living, something done by private individuals. She, even as queen, had no right to interfere in her people’s piracy, any more than she could tell farmers not to farm or hunters not to hunt. The Illyrians regarded passing ships as a kind of natural resource. Plundering those ships was just a way of harvesting that resource, like pulling fish from the sea in nets. It was not an attack upon a particular people or nation. Anyone who sailed the seas was accepting the risk of being plundered and had little right to complain about it. As far as Teuta was concerned, the Romans had no business complaining to her: she wasn’t at war with them, and her people had a natural right to plunder any ship that passed by. Of course, the Romans didn’t see it like that. From the point of view of Roman merchants, it didn’t much matter whether the people raiding their ships and stealing their goods were agents of a monarch or private entrepreneurs. In response to Teuta’s seemingly dismissive answer, Rome launched an attack on Illyria. 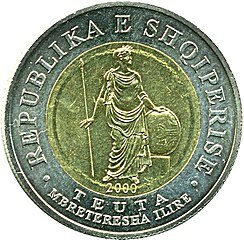 After brief fighting, Teuta’s forces were beaten and she, though allowed to remain in power, was stripped of most of her territory and forced to pay tribute to Rome. Queen Teuta’s response to the Romans offers us an alternative view to the dominant Greco-Roman narrative of Mediterranean history. Even though her answer comes to us filtered through the perspective of a Greek historian who casts the Romans as the heroes of the story, we can still understand the logic of her point of view. To her, the difference between war and piracy mattered; as queen, she had the right to control one activity, but not the other. Race in Antiquity: Who Were the Romans? Part 6: Who Were the Romans? In the last post in this series, I explored the question of who we mean by the ancient Greeks. It’s a more complicated question than it seems and doesn’t offer any easy answers. When we turn to the Romans, find that, if anything, Roman identity was even more complicated than Greek. The history of Rome was one of expansion and contact with a larger world. The city of Rome itself was located at the crossing point of two important routes of travel: the Tiber river, which ran from the Apennine mountains to the sea, and an ancient trade route that ran along the western coast of the Italian peninsula. Early Rome flourished from the trade that ran along these routes, and a degree of openness to outsiders was part of Roman identity from its earliest days. Indeed, the city of Rome itself was formed out of several originally independent hilltop villages that merged into one city-state as they grew. The people of Rome were Latins and they shared an ethnic, linguistic, and cultural identity with the people of other nearby Latin cities. There was never a time in Roman history when Roman identity did not embrace people of multiple different origins. Like Greekness, Romannes had never been conceived of as an ethnic or racial identity. There was never a moment in Roman history when those who called themselves Romans believed that they were a genetically distinct people, separated from the rest of the world by an uncrossable barrier. 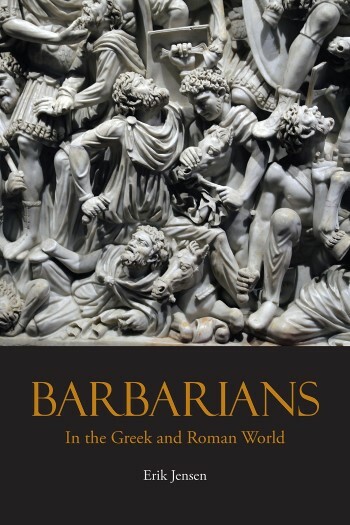 Although Rome’s empire was created and sustained by acts of violence against outsiders, some of them arguably rising to the level of genocide, Roman culture did not invent or impose racial categories on its victims in the same way the modern empires have done. The question of whether someone was Roman or not was never one that could be answered by the characteristics of a person’s body or an examination of their origins and ancestry. As with the ancient Greeks, any questions we pose about the race of the ancient Romans must contend with the ways in which those who identified themselves as Romans thought about themselves and the world around them.